The Long and Winding Road | Hello Cool World! There are two things that one should always do when traveling. The first is to stop and smell the roses. The second is to stop and read the road signs (especially if they provide important information). Our mission for the day was to drive the demanding route that I had cycled through the Alps about 25 years ago. Let me backtrack…Following a wonderful year studying French at the Sorbonne in Paris (and serving as a nanny to a 3-year old), a much younger self headed out on an 11-week cycling trip through central-south France with a friend from Calgary. We began in Grenoble and headed west out of the mountains, south, then east, and then finished with a grueling last few weeks up through the Alps to return to our starting point. Although our legs were trim after having spent so much time in the saddle, several of the mountain passes we tackled gave us grief. The one that is engraved in my memory is Col de la Cayolle; I remember it as a long, steady climb, which required me to stand on the pedals for the final 26 kilometres to make them turn. When we arrived at the top at 6:00 p.m., all I could think to do was to push my bike as far away from me as possible as I never wanted to see it again. Fortunately, there was a lovely little refuge (or hut) at the top of the pass. After a good night sleep, we coasted down the other side for 35 kilometers, and continued on our way to tackle even more difficult passes. Not really believing that my family fully understood the difficulty of this endeavor, I insisted that we drive the pass so I could show just how crazy I was all those years ago. And so, off we set from Entrevaux at 10:00 a.m. fully primed for a long day of driving. 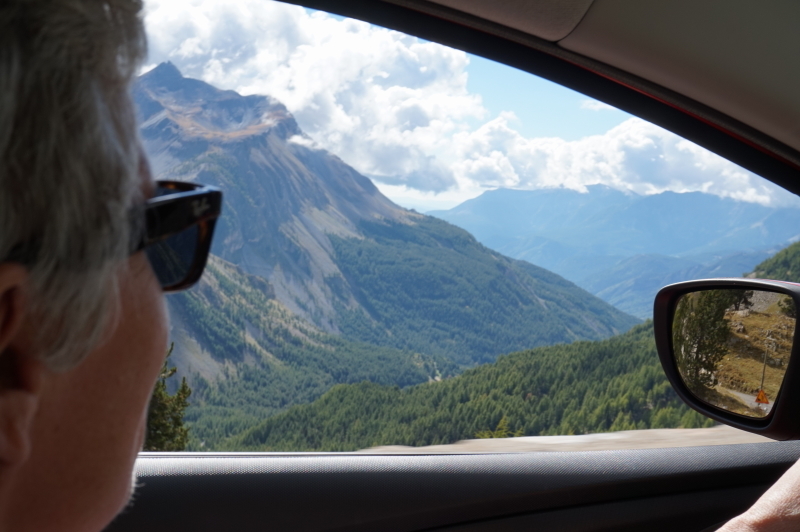 We were headed to Sallanches, near Mont Blanc, a drive of about 8 hours – assuming all went according to plan. As we took the turn off toward Col de la Cayolle, there was a largish sign that we likely should have stopped to read more closely. We quickly discussed whether to stop, but were reassured by a subsequent sign that indicated that the pass was open. We were on our way…. We climbed, and we climbed, with me exclaiming and commenting on how I remembered each and every agonizing kilometer. Finally, after two and a half hours of driving we reached the pass and stopped for a brief, celebratory lunch. Ah, it felt so good to recall the memories of cycling through this pass so many years ago. Not pushing my bike this time. My saviour 25 years ago. Coasting down the other side for about 45 minutes, we were less than ten kilometres from connecting with the main road at Barcelonnette, when suddenly we came across a road block due to construction. Had we stopped to read the sign three and a half hours earlier, we would have known that the road was going to be closed at 1:00 p.m. It was now 1:25 and we had missed the one hour window from 12:00 to 1:00 (lunch hour for French road construction workers) when it was open. It would re-open again at 6:00 p.m. Our options were to wait the 4.5 hours, or go back and find another route. In this part of the Alps, the options are slim. We chose the latter. 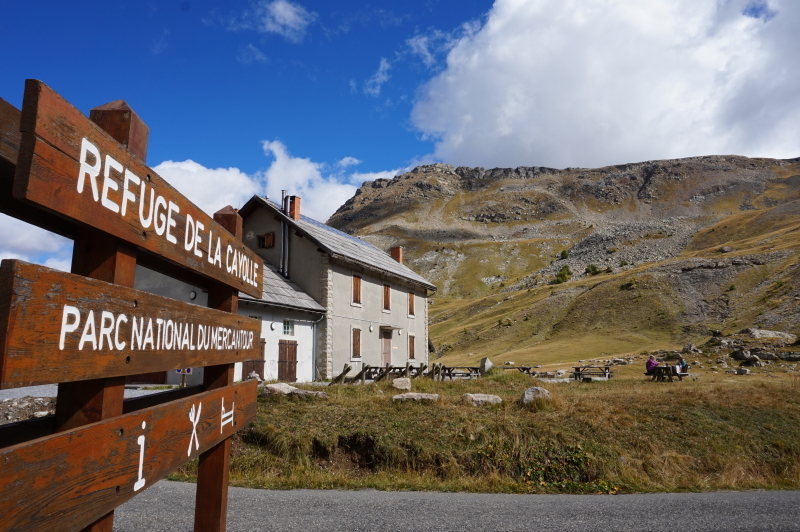 We drove back up the Col de la Cayolle, down the other side, across another windy, white-knuckle road, and then south to a point a mere 30 kilometres west of where we had started six hours earlier…sigh. There was nothing to do but push on – for seven more hours. At 10:00 p.m., we arrived tired, but happy, at our next Servas hosts – Richard and Anne. All in all, mission accomplished. I proved to my family just how grueling the Alps really can be. Ooh! Did you manage to get to Barcelonnette? It reminded me a lot of home! Nope. We came so close, though.